Sabina E. (Busch) Kistler, 90, of Avilla, passed away peacefully Sunday, June 24, 2018. Born June 29, 1927 in Kendallville, IN, she lived in Avilla most of her life, growing up and working on the family farm west of town on State Road 8. She graduated from Avilla School as valedictorian in 1945 and attended Valparaiso University. She married Ronald Kistler on February 12, 1956, and was married for 48 years until his passing in 2004. Together they spent many years with family creating life-long memories on their annual vacations traveling around the country, fishing at their favorite lake, or staying at their cabin in Wisconsin. 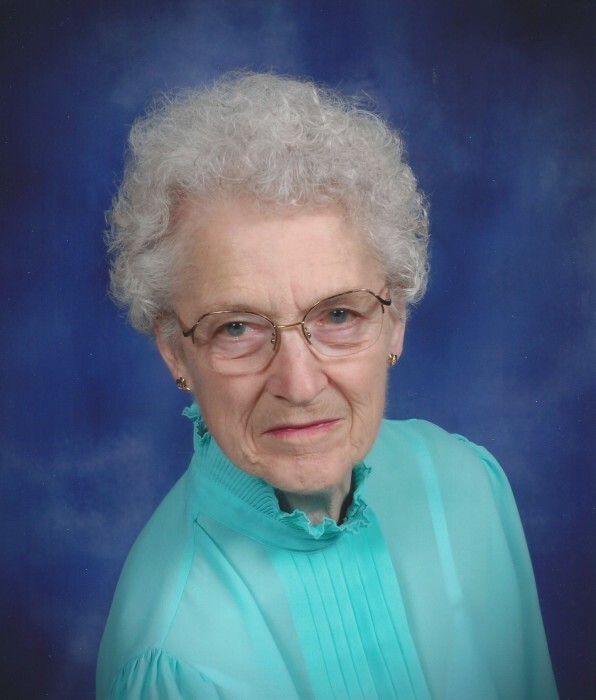 Sabina or “Bina” served as one of the church organists at Immanuel Lutheran Church for over 50 years. She was also a member of the Chancel Society, assisted with financial secretary duties, taught Sunday School classes, sang in the choir, and volunteered over the years for many other projects and church activities. Bina was an extremely generous and giving person, had a strong faith, and genuinely cared about all those around her. Bina worked at Sears in Kendallville, the Avilla Town Hall, and Riley’s in Avilla where she retired in 1996. Bina enjoyed collecting stamps and coins, was a skilled seamstress and crocheted many afghans in her spare time. She loved spending time in the garden, extensively canned vegetables, sauces and jams, and was an outstanding baker. She was talented at a number of arts and crafts and shared her crafts with many others. She took flying lessons and loved to go on long driving trips with friends and family when she was younger. She is survived by her daughters Denise Kistler of Avilla, IN and Ronda (Andy) Glowaty of Naperville, IL, and her son Gordon (Julie) Kistler of Ft. Wayne, IN, her grandchildren, Lindley, Danae, Jared and Aaron Kistler, and many nieces and nephews in-law. Sabina was preceded in death by her parents, Louis George and Grace Iris (Crum) Busch, and her husband, Ronald Paul Kistler. Visitation will be Thursday, June 28, 2018 from 2:00 pm to 4:00 pm and 6:00 pm to 8:00 pm at the Harper Funeral Home, 530 N Main Street, Avilla, IN 46710 and one hour prior to the funeral service that will be held on Friday, June 29, 2018 at 11:00 am at Immanuel Lutheran Church in Avilla. Interment will follow at Immanuel Lutheran Cemetery in Avilla, IN. Per Bina’s request, memorials may be given to the organization of your choice. To leave online condolences or sign the online guest book visit Harperfuneralhomes.com.